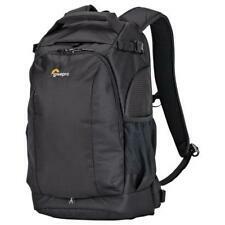 Lowepro backpack camera bag Flipside 300. Pre-owned but as new excellent unmarked undamaged condition. Flexible padded storage compartments. Side pocket for accessories. Carrying system for tripod. Security is assured when used as a backpack due to concealed inaccessible zip positioning. Comfortable padded harness straps with waist and chest fastenings. LOWEPRO FLIPSIDE 300 CAMERA BACKPACK. Great backpack for storage and transport of camera equipment. Lots of different compartments. Comfy to wear. Chest strap clip has a piece missing but still clips in fine. Black In good used condition from pet and smoke free home. 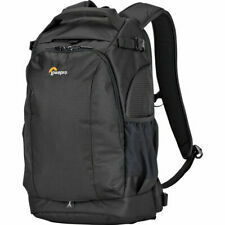 Lowepro Flipside 300 - Camera DSLR Backpack - Black. Condition is Used. Dispatched with Royal Mail 2nd Class. Organize gear with the padded, touch-fastening, interior dividers. The back panel is padded for cushioned comfort and improved cooling airflow. About SRS Microsystems. Capacity: DSLR plus 2-3 lenses and flash. Grab handle. Load in your DSLR with 2-3 lenses, or compact drone, as well as a compact tripod and 10” tablet. This may be because you made an impulse buy or simply chose the wrong item. It is not a "try before you buy period". Also Fits DJI Mavic Drone and Transmitter with GoPro or DSLR with Lens, Black. Up to a pro DSLR with lens attached (up to 80-200mm f/2.8). Also fits DJI Mavic Drone and transmitter with GoPro and small accessories or DSLR 5D or smaller with 24-105 f/4.0 or smaller lens. MICA/camo camouflage. Weight: < span class = notranslate ' > 1.2 KG. Paese di fabbricazione Cina. CradleFit ™ pocket suspends and protects 10 "tablet. Colore principale Nero. Review Lowepro 300 AW II. Padded Interior Top Pocket. Waist Belt Adjustable waist belt with quick-release buckle. IN THE BOX. Weight 2.64 lb / 1.2 kg. MPN LP37127. Manufacturer Lowepro. Color Black. 10" tablet. Compact tripod. Width: 28.5 x height: 25 x length: 49 x weight: 1.2. MFR# LP37127. Organize gear with the padded, touch-fastening, interior dividers. The back panel is padded for cushioned comfort and improved cooling airflow. We utilize multiple warehouses across the Continental United States. Removable waistbelt and adjustable sternum strap help distribute weight evenly. The bag is in good to excellent condition. There's a little snagged area on the pad that touches the back of the wearer. Outer storage pockets centralize digital accessories and personal gear for handy access. Product Weight: 2.64 lbs. 10″ tablet. Compact tripod. Lowepro Flipside 300 DSLR Camera Backpack Photo Travel Bag Lowe Pro Gear *USA* . Condition is New. Shipped with FedEx SmartPost. Tablet da 10". - Treppiede compatto. Verstaubare Stativhalterung. Abnehmbarer Hüftgurt und anpassbarer Brustgurt für eine optimale Gewichtsverteilung. Seitliche Netztasche für eine Wasserflasche oder Zubehör. Seitliche Tasche für Zubehör und kleine persönliche Dinge. Removable accessory pouch for neat organization of extras. Un support escamotable peut recevoir un trépied compact ou un monopied. Verstaubarer Tripod Mount™ sichert ein kompaktes Stativ am Rucksack. Gepolsterter Hüftgurt und anpassbarer Brustgurt für eine gleichmäßige Gewichtsverteilung. Zwei elastische Seitentaschen für schnellen Zugriff auf Wasserflaschen etc. Silent zipper pulls prevent jingling around film crews or wildlife. Removable waistbelt and adjustable sternum strap help distribute weight evenly. Verstaubarer Tripod Mount™ sichert ein kompaktes Stativ am Ru. Kompaktes Stativ. Integriertes, schützendes All Weather AW Cover™.